March 19, 2019 - Kate Capshaw, professor of English, and Cora Lynn Deibler, professor of illustration. Dummy for ‘Where the Wild Horses Are’ (1955), 26:9, The Maurice Sendak Collection. Archives & Special Collections at the Thomas J. Dodd Research Center, University of Connecticut Library. © The Maurice Sendak Foundation. Dummy for Where the Wild Things Are (1963), 26:9, The Maurice Sendak Collection. Archives & Special Collections at the Thomas J. Dodd Research Center, University of Connecticut Library. © The Maurice Sendak Foundation. “Wild Things,” for example, owes a great deal to the influence of French post-impressionist painter Henri Rousseau. You can see the influence of Swiss painter Henry Fuseli on “Outside Over There” and the influences of British caricaturist Thomas Rowlandson and Czech painter Josef Ladaon the recently published “Presto and Zesto in Limboland,” which Sendak created with friend and collaborator Arthur Yorinks. 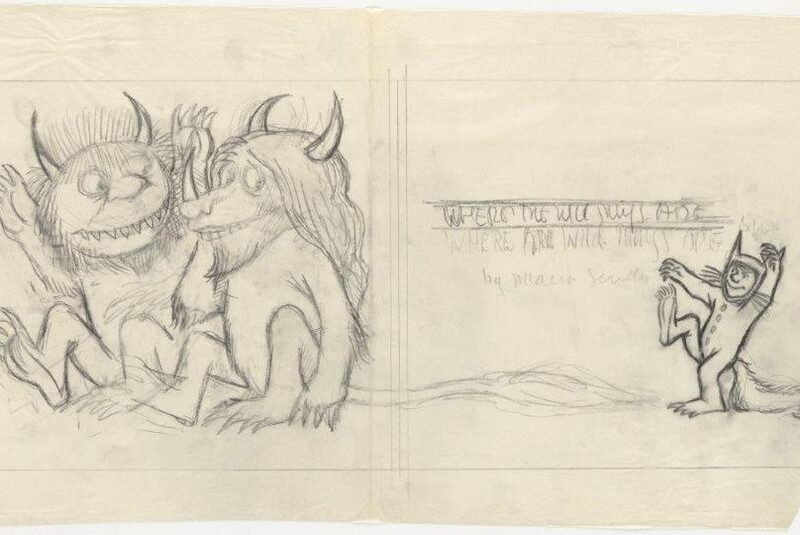 Preliminary drawing of dust jacket for ‘Where the Wild Things Are’ (New York: Harper & Row, 1963), 26:2, The Maurice Sendak Collection. Archives & Special Collections at the Thomas J. Dodd Research Center, University of Connecticut Library. © The Maurice Sendak Foundation. Preliminary drawing of dust jacket for ‘Where the Wild Things Are’ (New York: Harper & Row, 1963), 26:1, The Maurice Sendak Collection. Archives & Special Collections at the Thomas J. Dodd Research Center, University of Connecticut Library. © The Maurice Sendak Foundation.